My boys have a huge life-sized Tom Brady “Fathead” on their wall. Recently they’ve considered replacing Tom with Zdeno Chara, or at least adding him to the decor somewhere. I’ve forgotten to buy the Chara Fathead the past two Christmases. So this week, one would think Brady maintained his spot on the wall in light of the negative Chara headlines…then I see this, and it even made Chara look good. 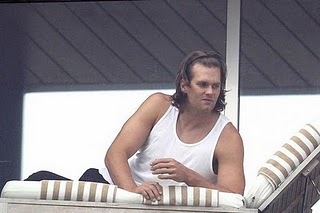 I mean really Tom, you have rivaled a broken vertabrae with your hairdo, do you know how hard that is? For the love of all that is holy, Tom, you are in Brazil- a country renowned for its hair removal!!! Do something about this mess. I mean, what’s next? Pigtails???????? 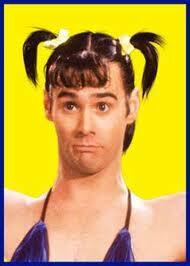 Remember Jim Carrey in In Living Color? Please someone take a Brazilian to Tom's head. This entry was posted in Uncategorized and tagged hockey mom, NFL, NHL, parenting boys, Tom Brady, Zdeno Chara. Bookmark the permalink. Love it! Get a barber!